Transformed from his father’s hunting lodge to a magnificent palace that was envied and emulated by sovereigns all over Europe, Louis XIV’s Versailles not only served as the seat of government during his long reign but as the locus of high culture for all of France and beyond. 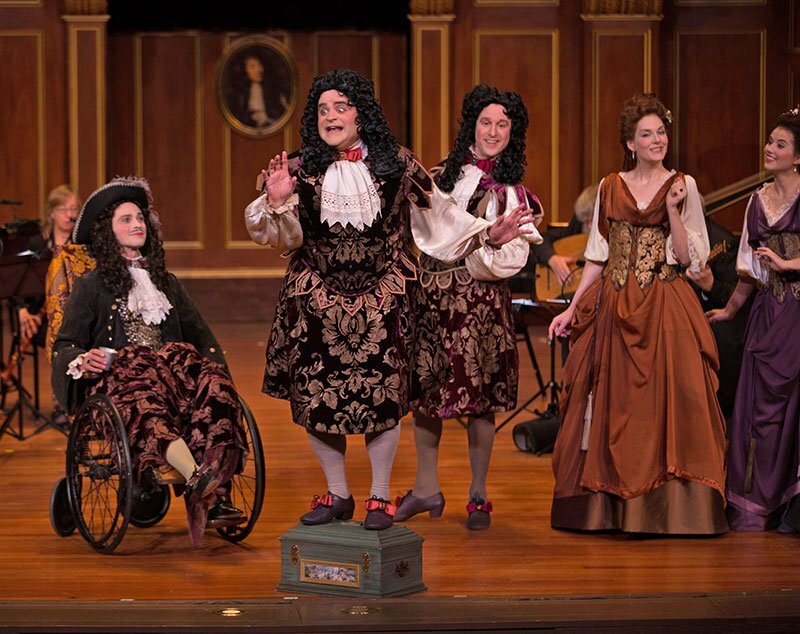 In its stylish revival of three stage works performed at Versailles for Louis and his courtiers, the Boston Early Music Festival Chamber Opera series gave us a tongue-in-cheek taste of what such courtly entertainments might have been like. “Versailles: Portrait of a Royal Domain” was staged on Saturday evening, November 26th, at New England Conservatory’s Jordan Hall, and again on Sunday afternoon, November 27th, with repeat performances scheduled for November 28th and 29th at the Morgan Library in New York. Gilbert Blin was the stage director, with musical direction by luthenists Paul O’Dette and Stephen Stubbs, dance direction by Melinda Sullivan, choreography by Carlos Fittante, and costume design by Anna Watkins. Violinist Robert Mealy was concertmaster. Marc-Antoine Charpentier (1643-1704), composer of the first of the three divertissements on the program, never actually held a position at Louis XIV’s court. After two years studying in Rome, he served as composer-in-residence and singer (countertenor) in the large private musical establishment of Marie de Lorraine (Mademoiselle de Guise), and was long associated Molière and his theatrical troupe. He also composed sacred music for a number of Jesuit colleges and churches, and later became maître de musique at the Sainte-Chapelle. Les plaisirs de Versailles, although probably composed for the musicians of Louis XIV’s son, the “Grand Dauphin,” was intended for performance in 1682 at the new courtly entertainment known as “les appartements du roi” (the king’s receptions) devised by the king. The librettist is unknown, but Gilbert Blin has suggested the fashionable writer and confidant of the Crown Prince Donneau de Visé as the likely author. 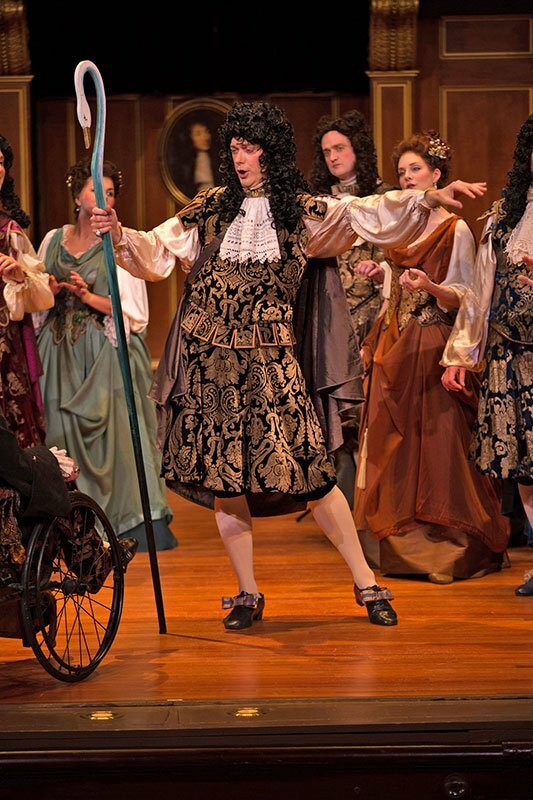 The entertainment for Louis XIV that followed consisted of excerpts from his favorite opera, Atys, by his official composer, Jean-Baptiste Lully (1632-1687). Born in Tuscany, Lully was brought to France at the age of fourteen as Italian tutor to Louis XIV’s cousin Anne-Marie-Louise d’Orléans, known as the “Grande Mademoiselle.” His subsequent rise was astonishing. By 1653, he was a dancer in ballets performed at court, dancing in the same entrées as Louis XIV. As Louis’s favorite musician, he was appointed by the king as composer of instrumental music, and in 1661, made superintendent of the music of the king’s chamber. He also collaborated with Molière in a series of comédies-ballets. In March 1672, he became director of the Académie Royale de Musique, the future Paris opera, while his fame spread throughout France, Italy, and England. Lully’s rivals were prohibited from using dancers in their productions, and from employing more than two voices and six violins. Atys had its première in 1676 in the old château of Saint Germain-en-Laye before being performed in Paris. In Versailles, excerpts from Lully’s operas were often performed in the “salon d’Apollon,” Apollo being the god of the sun and of music and embodying the king himself. For the two divertissements from Atys, the BEMF ensemble shifted forces: cellist Phoebe Carrai replaced viola da gamba player Laura Jeppesen, who took her place in the five-voice string ensemble as violist, and Stephen Stubbs replaced his lute with a resounding Baroque guitar. In Act IV, scene 5, of Atys, the river gods and nymphs of the fountains celebrated the wedding of the daughter of the river Sangar with the son of Neptune. Baritone Olivier Laquerre was a rousing Sangar, exhorting the company to rejoice. Soprano Molly Netter, alto Virginia Warnken, and tenor Oliver Mercer, along with other members of the chorus of rivers, demonstrated their skills as dancers as well as singers, their movements and gestures giving expressive articulation to the music. Act III, scene 4 is one of many famous Baroque sleep scenes. After a beautiful prelude for string ensemble and recorders, Sleep (tenor Aaron Sheehan) entered with a brief call for rest, followed by longer invocations from Morpheus (tenor Jason McStoots), Phobetor (baritone John Taylor Ward, and Phantase (tenor Oliver Mercer). Even the king was lulled to sleep, slumped in his wheelchair. The final divertissement , Lalande’s Les Fontaines de Versailles), took us from the interior of the palace to a dreamy imagining of its famous gardens, their statues, and their water plays. Born in Paris, Michel-Richard de Lalande (1657-1726) was employed as organist in four important Paris churches before being appoint Master of the King’s Chapel by Louis XIV. In addition to a substantial body of sacred music, he composed some 24 ballets, divertissements, intermèdes and pastorales. Les Fontaines de Versailles was first performed at Versailles in April, 1683. The libretto by Antoine Morel was intended to celebrate the king’s return from a recent battle. In the Jordan Hall staging, blue draperies transformed the large urns into sculpted fountains. The goddess Latona (Virginia Warnken), mother of Apollo, welcomed her son (Aaron Sheehan) and the goddesses of spring and summer, Flore (Molly Netter) and Ceres (Sophie Michaux), who hailed the return of good weather and soft breezes. Awakened from his profound sleep, the king (Carlos Fittante) performed a brilliantly executed chaconne, wielding a rapier with the utmost elegance. Even Encelade, the god of volcanoes, sung with menacing force by baritone John Taylor Ward, was tamed. Accompanied only by the continuo group of theorbo, guitar, and harpsichord, Bacchus launched into a jovial passacaglia on a familiar four-bar pattern. Fame, Comus, and the god of the Canal all claimed their places in the celebration. Once more Louis rose to join the dancers, who presented him with a plan of the gardens. Among the many pleasures of this divertissement were the perfectly coordinated ensemble singing from the four corners of the stage, and the virtuoso wind trios of two trebles and bass recorder, the same players doubling just as skillfully on oboes and bassoon. Our thanks to the Sun King as tastemaker and connoisseur, and to the members of the Boston Early Music Festival Ensemble for a brilliantly coordinated and revelatory evening. I attended the Sunday matinee and was delighted at the extremely high quality and polish of the singing. The production was imaginative and the dancing, particularly by singers who are not known to me to be dancers, was surprisingly graceful. As always the playing of the BEMF orchestra was superb. Ditto. With one additional comment. the Lully sleep scene was ravishingly beautiful and so well sung, a high point, I thought. And what always moves me is the wonderful ensemble singing of BEMF’s performers that often raises their solos to an even higher level of enrichment, as in this scene, or in the duets of Medsames Mireille Asselin and Lebel. Superb performances, with BEMF back to its usual high standard. I wonder if the music has ever been sung and played so well, and what gorgeous music it was. I was at Saturdays show and the dancing was beyond belief with subtle elegance. The dance was the quintessential ingredient which made the music all the more appealing. This celebration caste us into a place of delicate beauty and opulence. What a wonderful, magical, show beyond compare. I have learned my lesson: always sit on the orchestra level for these productions. One misses things from the balcony.